A luxurious Tuscan style Villa Hotel to rent, nestled directly on Punta Rucia beach, on the beautiful Caribbean island of the Dominican Republic. It is the perfect location for a relaxing getaway vacation, or as a base to explore the magnificent Dominican Republic north coast. 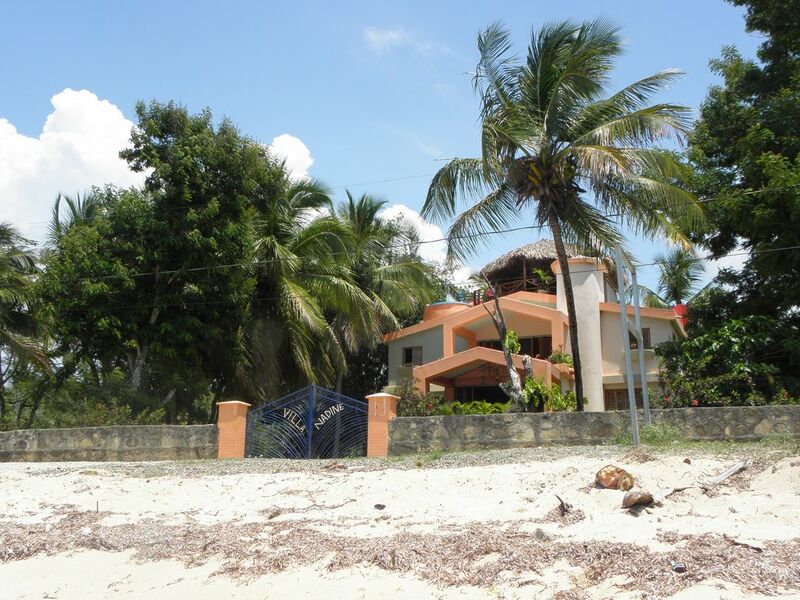 The gated property contains a luxurious villa with 3 bedrooms. 2 adjoining 1 bedroom casitas may also be available for larger groups. All rooms are ocean facing. Daily maid service, on-site management and Wi-Fi Internet is included. The villa's 3 bedrooms all have king size beds and en-suite bathrooms. A private rooftop entertainment area with an infinity plunge pool is included in the villa rental. Other optional features, available at a low subsidized cost include: meal plan, the villa's private yacht, and airport "meet & greet"
It is a beautiful property, well maintained and safe. Beautiful views from every floor. We stayed at Villa Nadine for 2 nights with a large group and absolutely loved it. Eric gave us all the information we needed before our arrival and responded promptly to new questions that popped up. We used his recommended boat guy (Hector) to get out to Cayo Arena, and upon our return we sat down to a delicious Dominican meal prepared by Francesca, a sweet woman who cares for the property and cleans the house. The rooftop deck was a great place to hang out and relax, listen to music, drink a Presidente, read, and watch the sunset. The property also has kayaks available for use! The colmado (mini market) nearby has the basics and a larger market nearby had everything else. The kitchen is fully equipped with everything you might need! There is some pica pollo across the street, a french restaurant nextdoor (we didn't try it), and a waterfront pizza place in walking distance. Playa Encenada with great fish is just up the road. I could go on and on about this place! We loved it! One final note, there isn't a/c but the breeze is good, and a fan is every room. We all agreed we slept well and didn't feel hot at all! We are already looking forward to our next stay!